Following Armed Forces Day, thanks to the kindness of dear friends and family, I was able to stay in the D.C. area for another week and a half greeting Honor Flights that came in. During that time, I was privileged to meet a grand total of 22 Flights and nearly 1,350 veterans (ages 70-101) from all over the United States. If the numbers sound crazy, they are a little. But 100% true. That is the beauty of Honor Flight. It brings together an incredible group of Americans for a united cause. A 100 year old Flyboy wants to see his Memorials in D.C.? Honor Flight can do it! Here are "just a few" of my favorite moments from Honor Flight Week. H U M I L I T Y / If you ask pretty much any WW2 veteran about his service in the war, he will probably tell you (with genuine modesty), "I was only doing what we had to do." B-24 waist gunner, Mr. H., was even a little more self-deprecating than that when he told me that the 9 months he spent in a German POW camp was, "nothing compared to some of the other guys." Despite the lack of food and poor living he experienced at the hand of the Germans (who were themselves starving), he just didn't think it was that significant. Especially, he said, compared to other POWS like Senator John McCain. Whether he considers himself to be worthy of the title POW or not is for him to decide. But there is no doubt that this man served our country bravely and well. It was an honor to meet this humble American. 1. Don't get no tattoos. 3. And, well... we'll leave it at that. (He added that I better get my life in order quick). And during the war...? "The Navy didn't want me so they sent me to Florida." Where he "fought the Battle of the Mosquitoes. They were mighty big and tough!" Yesterday while we were greeting Space Coast Honor Flight I spotted one of the veterans wearing his original USMC pins and rank on his name tag. Of course I had to stop and talk with him - Marine alert!! Mr. Mahoney told me a little about his service (taking basic at "Par-adise Island"), and after we had compared notes on the Marine Corps and talked about our mutual love of this splendid branch, he presented me with his Honor Flight challenge coin!! I was blown away. Something I will treasure greatly. Semper fi! For some Honor Flight veterans, the trip is a pilgrimage, more in honor and memory of their fathers' service than recognition for themselves. In speaking with this sweet North Carolina veteran, I was particularly moved by his purpose coming to D.C. Mr. A's father had served in the Navy in World War Two and had been a great inspiration to him growing up. So much so, that he too had joined the Navy, wearing the same uniform his father had worn before him. When Mr. A. had a son of his own, he hoped that he too would follow in the steps of father and grandfather, becoming the 3rd generation to wear the Navy uniform. The uniform was even a perfect fit. But his dreams were crushed when his bright 22 year-old was killed in a car accident. For Mr. A., yes, Honor Flight was a chance for his long over-due service to be recognized. But more importantly, it was an opportunity for him to personally pay tribute to his own father and hero. This is 3-war veteran Harry Miller. Mr. Miller told me that 60 days after he retired from the Army in 1966, he received notification from his local draft board that he had to register for the draft. Enlisting in the Army at 15 years old, Harry had never had time to register. Fighting in Europe in World War II, already in the Army in Korea, as well as early Vietnam, he was already in! But they insisted. So after a 22+ year career in the army, he signed up for the draft. Thankfully, he was never called up again. Harry also told me that after serving in a tank battalion in World War II, he lost most of his hearing. "I lost my hearing after... probably the first shell was fired," he said. "And it took five years before the ringing stopped in my ears." I had first met Harry a couple of weeks earlier when I was in D.C. with Greater Peoria Honor Flight, and had the pleasure of running into him again on Memorial Day! He told me that I should carry an umbrella around so I could really be the Statue of Liberty. A terrific guy, and one of America's finest soldiers! Finally, in preparation for Memorial Day, the USAA Traveling Poppy Wall had come to D.C. 645,000 poppies representing every American serviceman killed from World War I to the present. Truly, nothing could prepare for its visual power. Thousands upon thousands of poppies. 645,000 poppies, 645,000 servicemen. This is why we have a Memorial Day. 70th Anniversary V-E Day in D.C.
"You can't tell a man's bravery by just looking at him"
Today is Vietnam Veterans Day, so we are re-sharing an article from a couple of years ago about a few particular Nam vets who left quite an impact on us, and taught us it's never to late to say Thank You. A slight diversion from our normal topic... this year marks the 50th anniversary of the Vietnam War. Putting aside complicated politics and issues that came out of the war, when our fellas came home they were treated like trash. Many of the vets we've talked to thought that they were going off to fight Communism and save the world, just like their predecessors the WWII veterans. Coming home, then, only to be welcomed by being spit on, having things thrown at them, and called "Baby Killers," & "Murderers," was very demoralizing and crushed the spirits of many. One vet in particular, Mr. Adam, told us that he was treated so poorly after returning, that he retreated to the confines of his military career; rarely leaving the base, and almost never communicating with people outside his Army life. In the early 2000s, when there was a boost to show proper appreciation for the troops overseas, he felt very bitter. Last year when we went as guardians on Austin Honor Flight, we had the pleasure of traveling with many Vietnam Veterans. Before the trip was halfway done most of them were in tears at the gratitude they were being shown -for the first time. After all these years it didn't seem possible for them, but it was! At the end of the trip, we asked one of the vets, Mr. D'Amore what those two days had meant to him. He said two words, "Healing and closure." After all these years, there was finally healing and closure. In our group was a set of friends (including two pairs of brothers) who were all born and raised in the little town of Granger. They did everything together, even went off to war together. Serving their time overseas, they eventually all came home -together. We like to think of them as the "Granger Boys". Last year they decided to sign up for an Honor Flight. Gathering at one of the houses, they filled out the applications and mailed them in one envelope to Austin Honor Flight. If they were going to do this, they wanted to do it together. And they did. Throughout the whole Honor Flight they were practically inseparable. Shedding tears of relief and joy, remembering their comrades, and receiving the welcome they never had. "There was no fanfare," they told us, "We just stood around. This is our welcome home. It's like having a baby, we feel that good about it... when you're baby's born you have tears. And you have tears when you go through that airport." All their lives they had done everything together, and now they had finally received their welcome home -together. Welcome home Granger Boys. Don't forget these men, the Veterans of Vietnam. They fought in a messy, messy war; many of them coming home with great scars. It's an easy thing to say thank you. As Mr. Mike said, "Just a handshake is worth ten times a medal!" We are so excited to announce that we will be in Illinois July 23rd for a grand old-fashioned, fun-filled afternoon at the Wheels O' Time Museum raising $$$ for our wonderful friends at Greater Peoria Honor Flight. If you are in the Peoria area, or don't mind a little drive, you should definitely come on out. It is going to be a FABULOUS afternoon! Veterans are Free. The last few months we've been a bit thin on the blogging part of Operation Meatball, mainly due to an increased busyness with work and life; so for anyone who has stuck around this long, we're going to try and catch you up on a few of the things OM has been doing this fall. To start off, one of the highest points of the year was our first Honor Flight as guardians. Now, if you’re not already familiar with Honor Flight, you should definitely google it, or go back and read some of the previous things we’ve written on it, because the Honor Flight program is one of our favorite organizations out there. Seriously, it is top of the list. Over the last year and a half we have had the privilege of spending time at the WWII Memorial to greet especially large numbers of Honor Flights and this is an experience like none other. But to date, none of us had yet had the opportunity to go as guardians with an Honor Flight, which we knew would be the creme de la creme. Then, through a remarkable providence (and quite out of the blue), the opportunity arose for Jubilee, Faith, and me to became official Honor Flight Guardians with Austin Honor Flight. We were given the date and told that the three of us were to be assigned to two WWII veterans, both 95 years of age. Well, you can imagine the excitement and anticipation this gave us. By the time we arrived at the airport on the travel day, we were quite busting at the seams. (l-r) Faith, Mr.Covill (95), Liberty, Mr. Virden (95), and Jubilee. All set and ready to go! When we thought we could hardly wait any longer, our veterans arrived and we were introduced to our two “dates” for the weekend: Mr. Virden and Mr. Covill. With some time to kill before boarding, we pummeled our new friends with five thousand questions. We learned quickly that they were both Air Force veterans, one an electrical engineer, the other a pilot. Well, with such similarities (not to mention years) Jube, Faith, and I immediately determined that we would have to adopt a nickname for our delightful little party of Texans. This would be forthcoming, but it was time to head out. For the last flight of the season, Austin Honor Flight took a group of about 37 veterans: 7 WWII, 6 Korean War, and 24 Vietnam veterans. Added to that were the numerous guardians and staff of Austin Honor Flight, making quite a nice size group of wonderful individuals. One of the best parts about Honor Flight is the great lengths they go to “showing honor to whom honor is due.” Many of the veterans (WWII, Korean, and Vietnam alike), who traveled with us had never been properly thanked or shown the appreciation due them for the services they gave to their country. Because of this there were many scars that, though somewhat healed over time, still occasionally flared up and caused sores; whether it was guilt about comrades who never made it home for the WWII vets, horrible memories of the fierce fighting in Korea for an unacknowledged war, or bitterness felt by the Vietnam vets for the shameful way they were treated after returning home from a war that they didn’t fight of their own volition. However, this was just about to change, and boy did they have a surprise in for them! As we made our way past security, we all lined up to head to the departure gate. Suddenly, the magnificent drones of the bagpipes announced to everyone, “let the party begin.” (p.s. for those who don’t love the bagpipes, I’m afraid you are missing out on a bit of heaven). Now, if you have ever had to walk from one end of an airport terminal to the other, believe me it is a long and tedious walk. But this day it wasn’t; for crowding every single inch of the terminal were hundreds and hundreds (maybe even a thousand) of clapping, cheering, crying, hurrahing, and more clapping people. Literally, not a single person was left out. The love shown to the veterans was unequaled. When we got to the gate, there were a few more Honor Flight ceremonial formalities to go through, including the singing of the National Anthem. If there was anyone who made it through the parade of honor without shedding a tear -no longer. It would be safe to say that there was hardly a dry eye in our entire group of veterans. How can you resist a tear or two when you are surrounded by brothers in arms who are all devoted to their country, all singing her anthem so gloriously and with such passion! One of the Vietnam veterans later told me that the parade through the Austin Airport terminal was the highlight of the trip. Why? Because the physical and verbal abuses he had received from his fellow Americans after returning home from Vietnam were such that he wanted nothing to do with most people. In the last few years, when our soldiers returned from the Eastern fighting, he felt bitter and frustrated by the way they were received. It did not seem fair that they were welcomed home as heroes, and he still had to carry the shame of his war in Vietnam. But that was now changed. Walking down the terminal that day, he was greeted with probably the greatest expression of love and appreciation he had ever received, and it was from the people in his own hometown. The healing process had begun. If I were to go into every story from the Honor Flight, every person we met and talked with, it would take forever for me to write it up, and for you to read it. But hopefully, over time, I want to write up the stories in smaller, more chewable parts. Stories like, “The Granger Boys,” as we called them: a set of five friends from Vietnam who grew up together, served together, and would not go on the Honor Flight unless they could go together. Then stories like a sniper from the Battle of the Bulge, a special Korean War veteran, and oh, about 6 dozen more stories. Jubilee and Mr. Covill, about to board the Southwest Airlines flight. Dinner at the hotel was a great experience. The veterans were invited to stand up and share a story with us if they wished. Some did and some DID. I think excitement must loosen the tongue. There were more than a few moments of hilarity, but also a few near-tear jerker moments. One of the veterans had only shortly before learned that a close friend from the war in Vietnam, whom he had not seen in 40 years, was traveling on the same trip! Coincidences don’t happen, and the joy at this long lost friendship now found was very exciting to see. As the evening came to a close, our two dear veterans were in high spirits with great anticipation for the following day's events, but ready for a bit of rest (and so were we!). Liberty, Mr. Virden, and Faith. TOO early in the morning! After the celebrations on the 8th, the party continued out at the Udvar Hazy Center (National Air and Space Museum) where there was a living history camp with numerous jeeps and tents, a fly-in of a few of the planes from the previous day, live music performed by the superb United States Air Force Band, and, topping it off, we got to see our friends from DFW Honor Flight two days in a row. Over the following days, we had the best time greeting Honor Flights from South Carolina, Illinois, Arizona, and Puget Sound. We met a couple of these Honor Flights last year, so it was great to see some of their amazing staff again and meet their new veterans. Living down at the bottom of Texas, this is a wonderful opportunity to meet folks from so many different states. Each brings a unique element from their hometown, with lots of memories and stories to share. It is really remarkable the affect the WWII Memorial has on some of these dear folks. Seeing the wall of stars or the name of a battle they were a part of, written in stone, recalls to mind many dusty memories. One of the veterans made a comment to us that we mentioned elsewhere but is well worth repeating. We were standing in front of the wall of gold stars (each representing 100 men and equaling a total of 4,048 gold stars), and, as we talked, he sort of turned and looked at the wall and said thoughtfully, “There is a star on that wall that was supposed to be for me. But it is for my friend instead. He took my place.” The remark was brief, and he soon moved on to another topic, but later on, when we asked him about it he said, “I don’t like to talk about the war... It was in the middle of a fight, and I moved over and my buddy was hit by a grenade right where I had been.” The brevity of his comment made it all the more impactful. In just a few words he communicated a tremendous depth of feeling such that anything more might have been too much. It was a lovely and memorable week for us and the veterans up there. The Honor Flight staff and the wonderful people who volunteer their time at the Memorial greeting Honor Flights with smiles, hugs, motorcycles, and dancing add so much to the experience, and the veterans go home with pleasant memories of their trip to D.C. Faith had the honor of singing "God Bless America" with the Honor Flight from her own home state -Texas. Honor Flight Weekend in Washington, D.C. Going to Washington, D.C. on an Honor Flight is a once-in-a-lifetime event for a veteran - whether WWII, Korea, or Vietnam. Being given this opportunity means so much to these men, and it’s a small way we can show our gratitude by recognizing and thanking them for their service and sacrifice. This veteran Jubilee is greeting is wearing his original uniform from WWII. We met dear Mr. Morrison (a Korean veteran), who talked with us and told us stories throughout his time at the memorial. Faith was able to sing him, which we could see on his face he throughly enjoyed. Mr. Morrison walks and talks with us on his way to the bus. Something we noticed this day, and the days following, was that many veterans pushed their own wheelchairs into the memorial, insisting on walking in. That just tugs at one’s heartstrings. The contrast on Friday was amazing. It was a clear day full of sunshine. After welcoming the last bus of veterans for the day and waving goodbye, we went to Reagan International Airport to welcome the Austin, Texas Honor Flight who would be visiting the memorial the following morning. One dear WWII veteran started crying after Faith said thank you and handed him a rose. He told us that on his way to D.C., he was so depressed about the road America has gone down, realizing we’re losing our freedoms and everything he and his friends fought and died for 70 years ago. But when he saw us, the next generation, caring about history and the men who fought for our freedoms, it brought tears to his eyes and he said it gave him a renewed hope in America. Faith had the wonderful opportunity to go down the line of veterans singing their favorite songs while they waited for the bus to take them to their hotel. In preparation for Super Saturday, we purchased 46 dozen roses, and by the end of the day, we only had a few roses left. Can you imagine that many dear veterans in one place on one day? Saturday was so amazing; a day I will remember for the rest of my life. 580 veterans from WWII, Korea, and Vietnam were present at the memorial all throughout the day on Saturday. Wow. It’s so difficult to find the proper words to describe this day. Handing them a rose, we would grasp their hand and say thank you. The impact of the roses was incredible - one would never think a simple flower could bring such joy and open the door so easily to wonderful conversation. This kind man had brought a framed picture of himself and his friend from the war. It was so sweet to see the Austin veterans we had met the evening before at the airport, holding the roses we had given them the night before. Virginia, being the cutie pie of the bunch, literally stole the show. The veterans adored her. She was so sweet and smiley to them, and I’m sure she received a special place in all their hearts. Unfortunately, we all can’t be cute little blonde seven-year olds! The last WWII veteran we met and talked to on this wonderfully full day was Mr. Cochran from Texas. In 1942 he joined the Navy and was a mechanic on the U.S.S. Puffer. He married his wife Bonnie in 1943 when she was 15 and he 19. Mr. Cochran is pictured here in the wheelchair. His wife, Bonnie, passed away last November after 71 years of marriage. The sweet woman next to Mr. Cochran is 99 years old and very spunky! They were married 71 years, until she passed away last November. Isn’t that so incredible? 71 years! We could tell he really missed her - he choked up when talking about her. Two of his grandsons accompanied him to DC. Such lovely people. My heart was so full as we left the memorial that evening, after welcoming, thanking, and hugging all those sweet, dear veterans. Washington state was the only flight on Sunday, and I’m so glad we were there to greet them. I can only say it was another wonderful, blessed day and we met dear Mr. McGuirk and his son. It was such a good way to end our time in D.C. I can’t imagine us having missed it. Mr. McGuirk tells Madisson goodbye at the bus. I cannot imagine how brave a person must be to be in harm’s way or dedicate one’s life to protect people he has never met. From the bottom of our hearts we thanked them for their courage, self-sacrifice, and bravery. We thanked them for their service to our country and for putting their lives at stake to protect the freedoms we hold so dearly. We thanked them for believing in the stars and stripes. America is eternally blessed for the presence of men like these who believe liberty is always worth fighting for. These veterans (whether WWII, Korea, or Vietnam) didn’t fight to receive a thank you. They didn’t risk their lives for this monument in D.C. To be on an Honor Flight is an incredible opportunity and, not to mention, honor. We met Mr. Cason at the memorial, and had the privilege of visiting him at his residence a few days later. These veterans would have never asked for an honor like this, but you can see on their faces; it means the world to them. I hope and pray that we were able to convey, albeit inadequately, the gratitude and love we have for each one of them. I’m so glad I went. It was so humbling, thrilling, sobering, and incredible all at the same time. The veterans are always on my mind, and I know they’ve left a lasting impression on my heart. 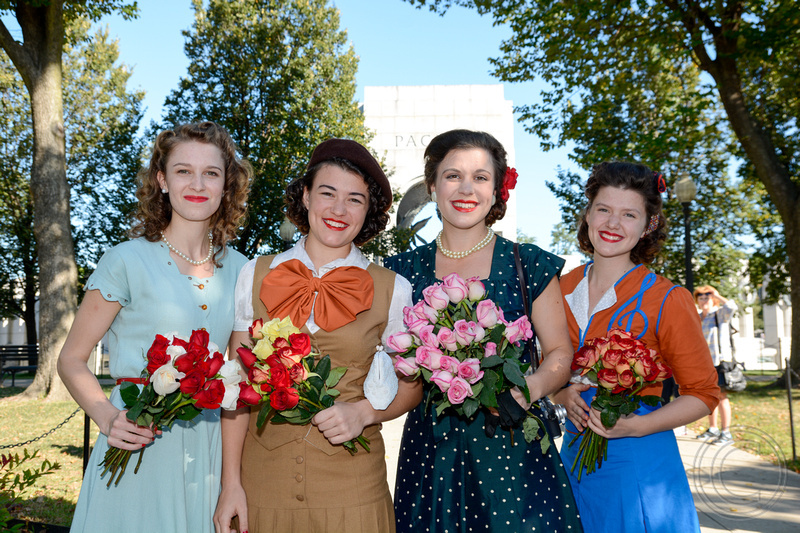 We are just a couple days in and we have met so many wonderful men at the WWII Memorial. The Honor Flight program has given a truly meaningful gift to these veterans by bringing them out to D.C. to see the memorial created for them. We have loved talking with them and finding out a little bit about their service and their life. Each one of these men, whether they are a WWII, Korea, or Vietnam veteran, has a unique and important story they are just waiting to be asked about. At some point during Honor Flight that comes to the memorial, all the veterans line up for a picture. It is one of the most incredible picture experiences we have ever watched: to see so much living history, pulled together for a brief moment in time before dispersing, never to meet them again. . .old men who were once strapping young boys with the world at their feet and a mission to save it. Now, they are brought to the memorial at the end of their life, grey-haired and in wheel chairs, but with a fighting spirit still in them having laid the world at the feet of the next generation. During WWII, mothers who had a son in the war would hang a blue star in the window or on the door. Later if the son was killed, a gold star replaced the blue one.. There are over 4000 gold stars on the wall at the WWII memorial. Each star represents approximately 100 soldiers who died during the war. When the veterans come to the memorial, this wall is very important to them. Mr. Burch learned the bag pipes four years ago to quit smoking. One of his favorites was Danny Boy so Faith got to sing it to him! Virginia has become the mascot for the veterans. Mr. Watling was stationed on a ship that was rather unusual compared to most Navy vessels. It was made of wood and approximately 132 feet long. He said "It was like a cork bobbing around in the water." Mr. Ditton told us he was practically born in the saddle. He got his first horse when he was 6 years old and road it to and from school very day. Mr. Ashley (Right) was a chemist's mate in the Pacific. After making it on to Tarawa during the invasion he helped to put up the hospital there. Mr. Ashley is the first "medic" we have had the privilege to meet. Mr. Robert Lake turned 18 the day the Japanese surrendered and was shortly after sent to relieve the fatigued, battle weary soldiers. He showed us a newspaper clipping of his cousin who was killed in Korea. Mr Vasen was stationed in Germany for almost a year. General Eisenhower passed in his limousine every day. Mr Vasen would salute each time. He never knew if "Ike" ever saw, but paid his respects nonetheless. We arrived in Washington DC last night. 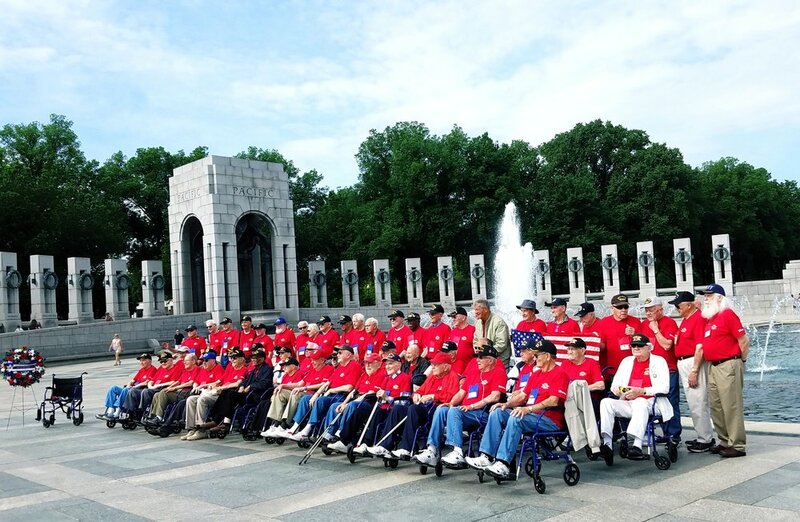 This week we are thrilled to be part of the group welcoming World War II veterans to D.C. The Honor Flights come in every week, carrying many WWII, Korea, and Vietnam veterans on a special trip to visit "their" Memorial in D.C. We visited the memorial last night with a very special guide, John W. McCaskill, a National Park Service representative and World War II historian whom we met three years ago in Pearl Harbor. His passion for honor and history is simply infectious. He walked us around the beautifully lit memorial with zeal and enthusiasm, explaining every aspect: The eagles, the fountain, the emblems, the gold stars, the bas reliefs, and on and on. This morning we joined a group of folks meeting the East Iowa Honor Flight coming in to DCA. What a beautiful experience! From there we went to the National World War Two Memorial and had a wonderful time there visiting with some very special people. Over the next week we will be having more regular updates and posts. So stay tuned. If you would like to see more photos than we will be posting here, you can sign up in the form below (make sure to put your full name with your email to be added). Sign up to receive special photo updates.